Floral designer Frances Harjeet shows how to take a birch branch frame to the next level with a silk canopy and profusion of flowers and greenery. From our sister site, Sew Jewish. The open skies and vast mountain ranges of Aspen provide a breathtaking backdrop for this romantic wedding chuppah created by floral designer and event stylist Frances Harjeet. Harjeet, whose firm Prema is based in Colorado, is known for her lush, romantic floral designs and impeccable styling. Her creations often emphasize our connection to nature. For this chuppah, she paired a birch branch frame with a silk canopy from Sew Jewish and added a profusion of white blooms and cascading greenery. Harjeet designed the florals for this wedding, and the wedding planner was Aspen-based Bluebird Productions. The photographer was Lucky Malone Photography. Sending out a big thank you to Frances Harjeet for sharing these beautiful images. Are you thinking about making your own wedding huppah but aren’t sure where to start? Do you have a design in mind but don’t know how to sew? Sew Jewish can give you a head start with a plain white canopy you can personalize with silk paints, embroidery, applique, and any number of creative techniques. Consider it a blank white canvas waiting for you to personalize and make uniquely your own. The canopies are available in two fabrics: silk and bridal satin. The silk version is or five and half feet square. The satin version comes in a variety of sizes from six feet to seven and a half feet square. What huppah design are you dreaming of? Silk painted pomegranates? Embroidered roses? Appliqued letters spelling out an inspiring verse? How about a bohemian-inspired tie-dyed huppah canopy? Of course, you can also use the canopy in it’s elegant white simplicity. The options are endless, and you already have a head start. Take a look at the silk huppah canopy and the canopy in bridal satin. The original Simplicity Huppah size that made this option so popular. Huppahs.com is excited to announce that our most popular huppah, the Simplicity Huppah, is now available with a larger canopy. Until now, the huppah has been available with canopy of 60”x60”. Now it’s also available with a canopy size of 68”x68”, providing an additional seven square feet of floor space under the canopy. This option is so new that we don’t yet have a photo of the larger size on the Huppahs.com website – the photo at the top shows the standard size that made this huppah so popular. The Simplicity Huppah is made with a sophisticated low-luster bridal satin in a substantial weight fabric for excellent drape. The canopy’s elegant simplicity has made this huppah a favored choice for all wedding venues, from five star hotels to country inns, synagogues, and city parks. 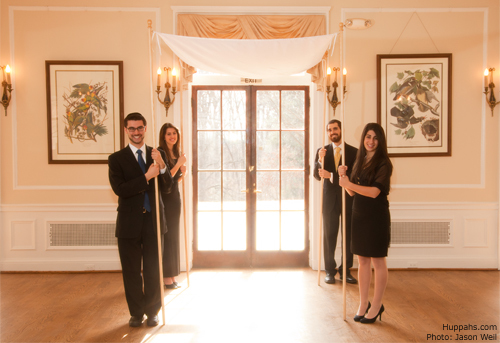 If you have your own huppah poles or huppah frame, both canopy sizes can be rented without poles. You can get more details about this option on the Huppahs.com website at Rent Wedding Huppah Canopy. For more information about renting this huppah, in either the standard or new, larger size visit the website at Simplicity Wedding Huppah. 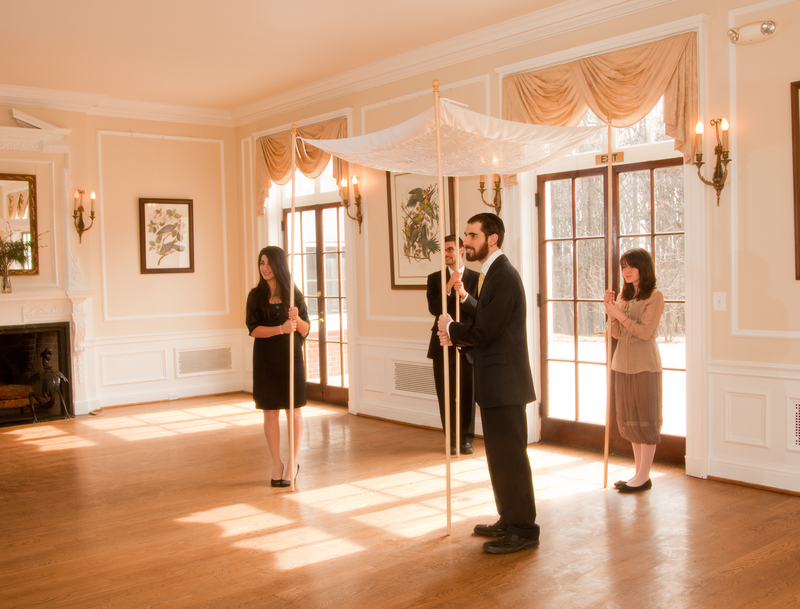 Have questions about the chuppah, Jewish wedding canopy, at weddings? 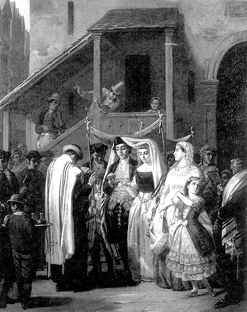 Join Rabbi Jillian Cameron of InterfaithFamily/Boston and me, Maria Bywater of Huppahs.com, LIVE as we chat about everything you didn’t think you needed to know about the wedding canopy – chuppah! From logistics to artistry to incorporating interfaith family members in the process and everything in between, come with questions or just to listen. This Sunday, October 29, 11:30AM EST on the InterfaithFamily.com Facebook page. Add it to your calendar, and join us! 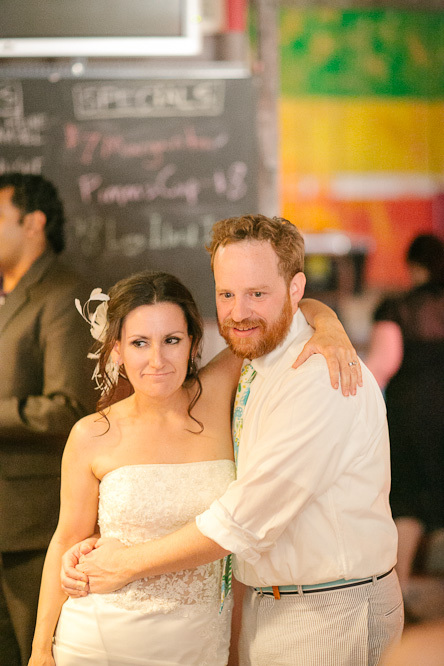 Planning a Jewish or interfaith wedding? I share personal tips for finding a huppah that fits you and your wedding style in my guest post now on Interfaith Family’s Wedding Blog: Chuppah: Your First “Home”. 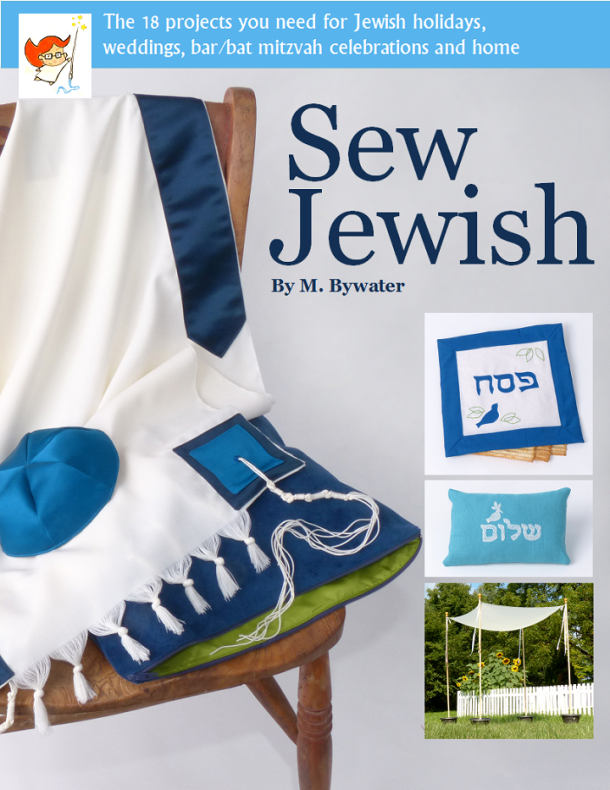 In addition to the huppahs available to rent at Huppahs.com, I’m excited to let you know that we are now offering huppah canopies for sale through our sister site, Sew Jewish. These silk canopies are dyeable, which means that you can dye them, use silk paint on them, applique, embroider, stencil — use lots of different techniques to make them personal and unique. 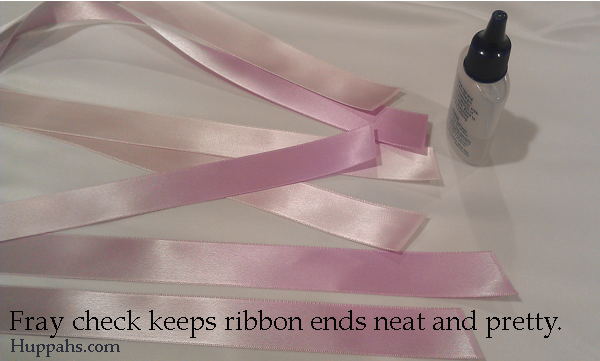 Find all the details at Sew Jewish: Silk Huppah Canopy. We’re pleased to announce that our Organza Huppah canopy is now available to rent without poles, for couples who already have poles. Huppahs.com ships huppah rentals everywhere in the United States. Get details about the Organza canopy at Huppahs.com’s Rent a Huppah Canopy page. And if you’re looking for a complete huppah, you can still rent the canopy with poles. Find out more at Organza Huppah. 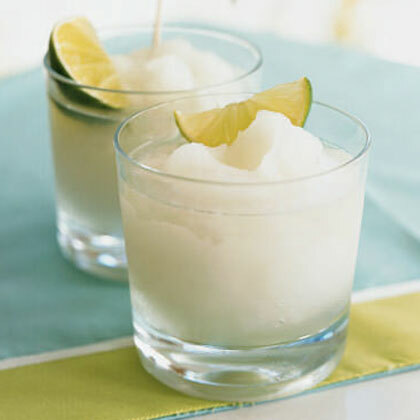 Here’s a cocktail to take us through the second half of this summer wedding season – or for winter weddings in warm locales! 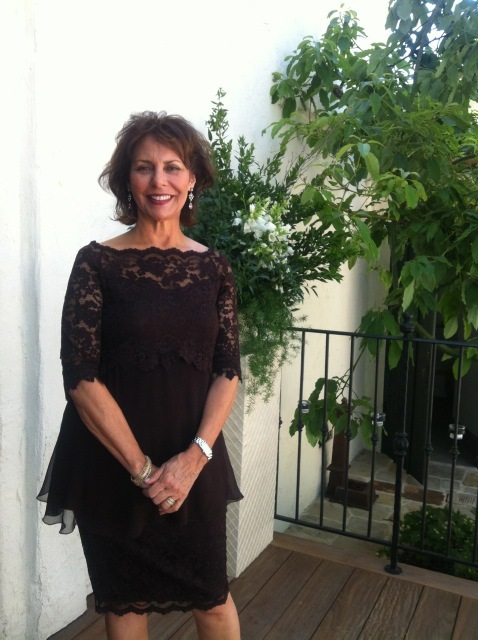 Hat tips to Elisa Bosley of Cooking Light 2007 for developing it and Fawn Thomas of the Destination Wedding Store for finding it. Maria shared this post from our sister site, Sew Jewish. 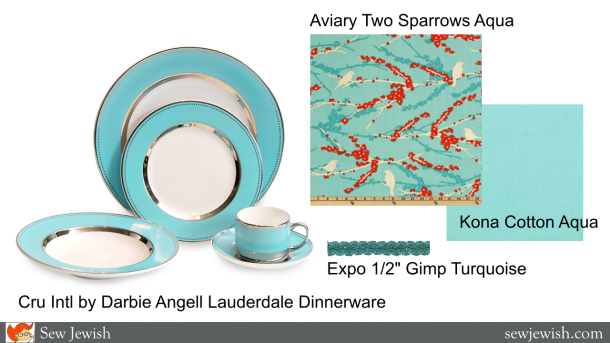 Find yourself looking at any wedding registries lately? How about using that registry as inspiration for a unique, handmade wedding gift: a challah cover that coordinates with the couple’s china pattern? The cover can become a highlight of the couple’s Shabbat and holiday table decor, covering the two loaves of challah bread, for years. 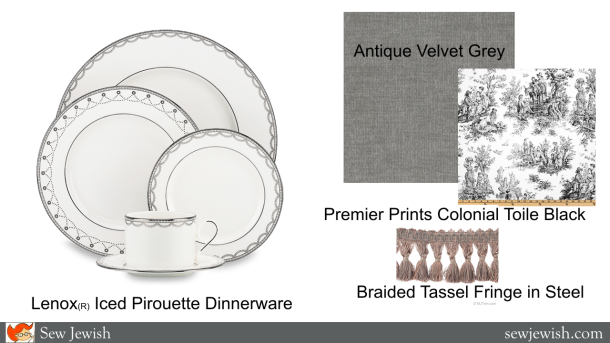 Start with the china pattern and consider the couple’s personalities to choose the cover fabric, lining, and trim. We’ve put together written instructions as well as a video tutorial that shows you how much to buy and how to put it all together. 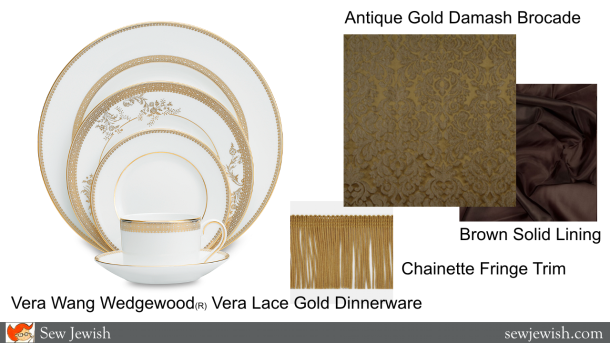 We found the brocade and lining fabric at Mood and the trim at Fabric.com. 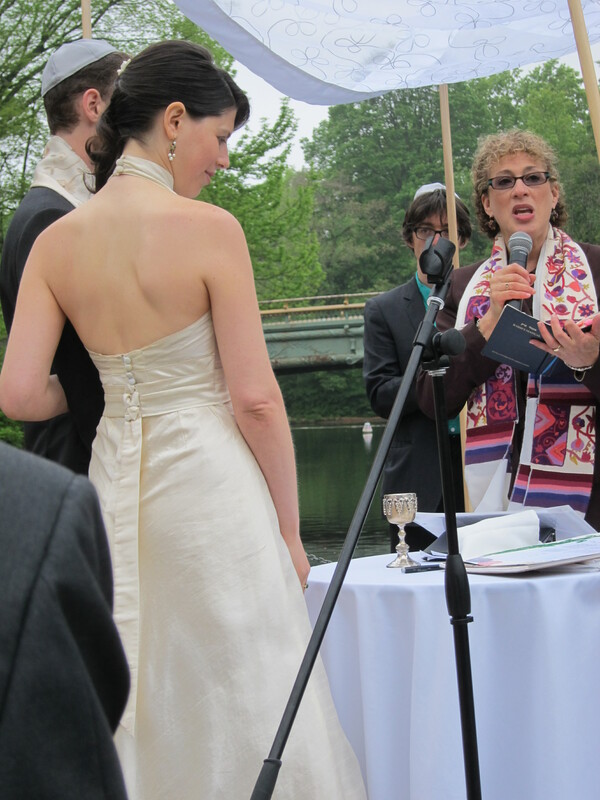 To turn the tablecloth into a chuppah, Marla attached ties that were tied to huppah poles from Huppahs.com. 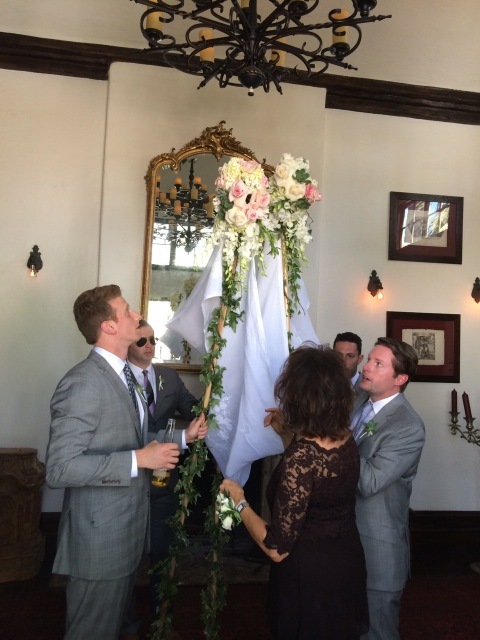 “The cloth was of fine linen and leaf appliqués, approximately 110″ in length,” Marla explains, “It wavered ever so beautifully in the breeze and added a serenity and magic to the ceremony.” Marla turned to florist Lynne Lucente to create the final touch of flowers and greenery. Marla, chuppah creator and proud mother of the groom. 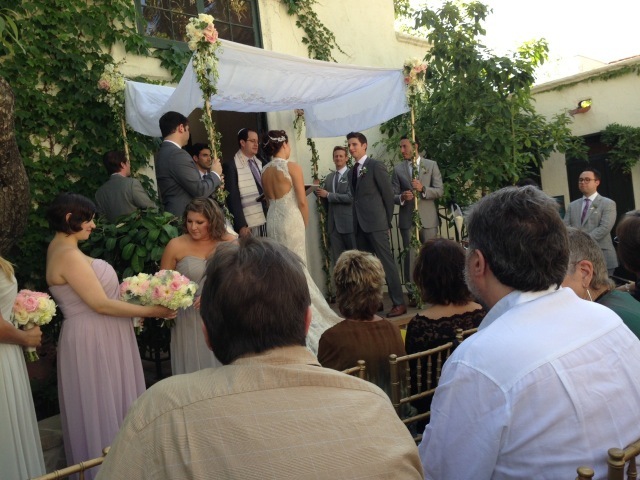 Thank you, Marla, for sharing the story and photos of this beautiful chuppah! Thought you’d like to see the list of trousseau items you’d probably pick up if you got married in 1960. Hats, gloves, formal wrap — Yes, I can see the gals of Mad Men opening a suitcase with just these items. 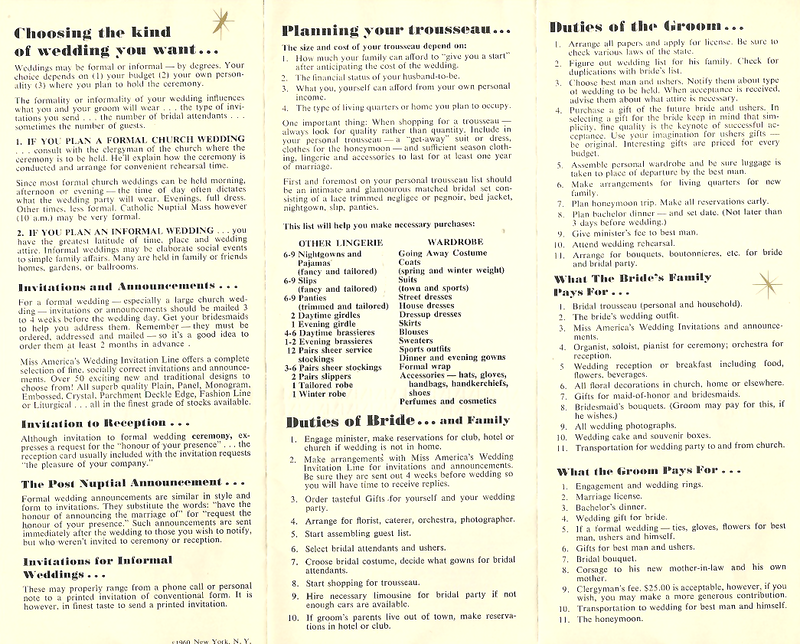 The list comes from the 1960 brochure of wedding tips from Miss America’s Wedding Invitation Line. You can see their recommendations for what to wear to your wedding here. Can I wear a black dress to a wedding or is there a thing about that? 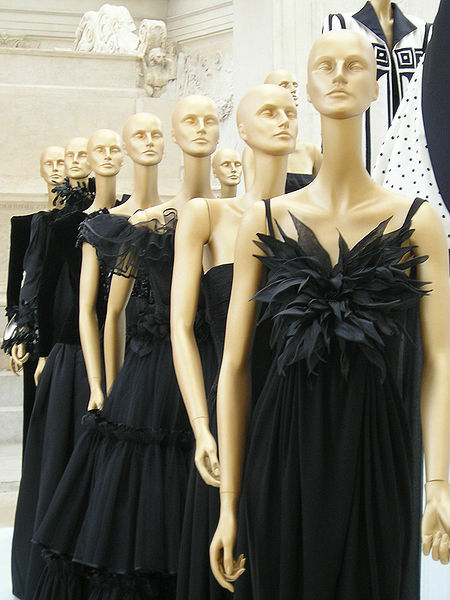 There is a long-standing custom to not wear a black dress to a wedding. Times are changing, but I would ignore this custom at your peril. It’s not worth being accused by people you care about that you are insulting the couple getting married or the occasion, and it’s not worth worrying during the whole celebration that anyone whose conversation you can’t quite make out on the other side of the room is talking about you. Now, I did once wear a black dress to an evening wedding in Manhattan. That’s about the only time you can get away with it. An elderly woman asked me if I was a model. I should have said yes. Final answer: Gurrrl, go out and and get yourself a fabulous new dress!!! If you want to keep your cash close, try Rent the Runway or Tradesy, which are both getting a lot of chatter these days.